The IC Cost and Price Model - 2019 - revision 02 is now available with extensive data updates. BUY NOW! To request a demo copy please send us an email. The IC Knowledge - IC Cost and Price Model is the industry standard for cost and price modeling of low power silicon integrated circuits. For high power silicon integrated circuits, discrete devices and compound semiconductors we recommend our Discrete and Power Products Cost and Price Model. The IC Cost and Price model does not cover 3D NAND and only covers DRAM up to the 2x generation, for 3D NAND or 2y and beyond DRAM we recommend our Strategic Cost and Price Model. The IC Model is very easy to use, the user only has to make eight selections or entry's and there is help for many of them. The model then presents a detailed analysis of cost and pricing and offers over seventy options for customization. Cost includes wafer fabrication, wafer test, packaging and final test. The Model supports over 660 processes broken out by company and process node and looking forward one process nodes. See the links in the gray bar at the right for the specific list of processes. The IC Knowledge - IC Cost and Price Model is widely used by IDMs, Fabless companies, Analysts, Consultants, Electronics Systems and Automotive Companies and many others. The model is used for benchmarking, evaluating pricing, market research and many other uses. Our model customers include most of the worlds largest IDMs, Fabless and Electronics Systems companies. For OEMs and Materials companies we recommend our Strategic Cost Model. Overall Model - Reviewed and updated selected foundry margins. Yield - Updated TSMC 10nm and 7nm and Intel 10nm defect density projections. Equipment - Fixed a bug in the equipment cost calculation for fabs built with used equipment. Processes – Fixed an error in the Samsung 11nm processes. Labor - Updated Malaysia direct labor rates. Lookups – Updated product margins. Packaging - Updated bonding wire costs. Added seed layer sputter to EMIB and organic substrates processes. Added street width for sawing to organic packages per sheet calculation. Updated copper sputter target usage. Increased cure times to account for queue time. Fixed a bug where wafer bumping costs weren't being included for Organic Packages where die are flip chip attached. Split chip shooters into die and capacitor. Updated organic susbtrate saw kerf width. Test - Fixed a formating issue on the 'Defaults' sheet. Updated test time for ASIC - performance 3, Mixed Signal and RF. Updated automotive burn-in and test. Updated NAND burn-in. 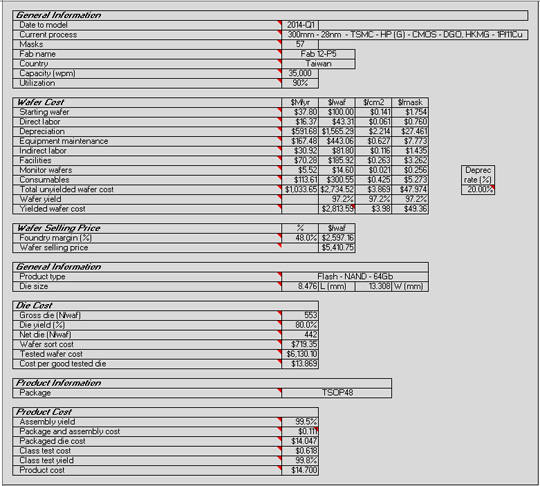 The Model runs inside of Microsoft Excel and requires the user to have Excel 2010 or higher installed on their computer. There are are known compatibility issues with Excel 2007 and Open Office and any third party Excel compatible product. A single user license for one person to install the model on one computer is $2,400. An enterprise license allowing an unlimited number of users at a company is $8,160. Lower prices may be available in our on-line store for credit card orders only! The model may be purchased on-line with a credit card here or you may email or fax us a purchase order with 30 day terms. The model is delivered by email within a few hours of our receiving an order. The model cost includes twelve months of updates plus twelve months of reasonable levels of phone and email support. A Web Ex training session is available on request. Renewal costs at the end of twelve months are discounted 1/3 off the current prices. Discrete and Power Products Cost and Price Model - easily calculate the cost and price of most high power silicon integrated circuits and discrete devices. Strategic Cost and Price Model - easily project wafer cost, equipment and materials requirements for leading IC producers. Add process request form - this form is for customers to use to request us to add new processes to the model - updated April 8, 2016.